Mental health has become an increasingly vital issue on our campus. The facade of the perfect Stanford student (Stanford Duck Syndrome) means that real emotions and struggles are often suppressed. It is heartwarming to be able to connect with people on campus and see how they feel, in a familiar, yet anonymous way. Having the moment to connect with another person's experience of struggling with a Mid-Term or the Happiness after Stanford beats Cal can be amazingly uplifting. Our cross-platform app allows users to share how they feel in words. Their feelings are geolocated onto a map with a circle and with a timestamp anonymously. Our NLP sentiment analyzer creates a color for the feeling based on the sentiment of the feeling expressed. This provides a cool visualization to see how people feel across different geographic levels. For example, you can zoom into a building to observe that people are generally happy in the Huang Engineering Center because of TreeHacks currently and Zoom Out to see people in Stanford are generally stressed during midterm season. The ability to zoom in and even tap on a specific circle to see how a person feels in words allows you to go local while zooming out allows you to go global and gauge the general sentiment of an area or building as transparent colors overlap into generalized shades. It is a fascinating way to connect with people's deepest feelings and find the humanity in our everyday life. Our front end was built in React Native through Google Maps and uses Node.js. Our backend consisted of a Flask server written in Python, on which our NLP sentiment analysis is done (Artificial Intelligence), determining colors for the circle based on the feeling estimated by the language model. Our database of feelings entries is stored in Firebase on the Cloud, with data being written to and from, to overlay feelings entries on the map. We also have a script running on Firebase to remove entries from a map after a certain time period (example 6 hours, so only the most recent entries are displayed on the map to the user). Our Flask Server is deployed on Heroku through the Cloud. Getting Flask to communicate with our React Native app to produce the NLP sentiment analysis. Setting up our backend through Firebase to create markers on the map and persist user's responses in the long run. 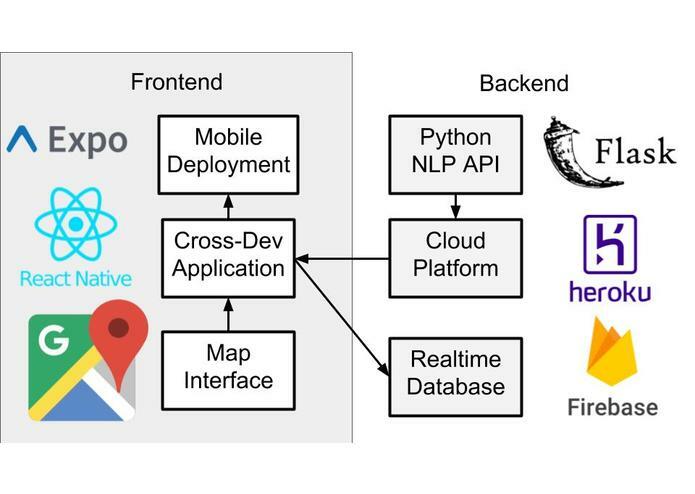 Integrating all the different components was fascinating from Firebase to ReactNative to the NLP Sentiment Analysis through Flask. We had no prior experience with React Native and Node.JS, so we learned this from scratch. Integrating all the different aspects of the solution from the frontend to backend to cloud storage was a thrilling experience. We hope to add features to track the emotional wellbeing of areas in the long run as well as encourage users to develop the skills to track their own emotional well-being in the long run. We hope to apply data analytics to do this and track people's emotions related to different events/criteria e.g. Housing Choices, Weather, Big Game etc. I worked on the front end in React Native, the backend using Firebase and integrating all the components of the app together (Flask Server - NLP, Firebase, React-Native App). I worked on the back end, writing scripts in Node.js & Flask to integrate the front-end presentation with Firebase hosted databases. Additionally acted as graphic designer for application.